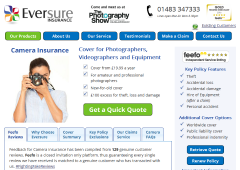 Eversure Insurance offers clear and dependable cover from as little as £19.99 per year for up to £50,000 of equipment. This cover is designed to be flexible enough to cover amateur, semi-professional and professional photographers. 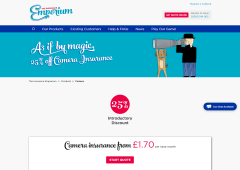 Whether you’re a business photographer or an amateur photographer, The Insurance Emporium’s camera insurance could help you protect your photography cameras! The Insurance Emporium’s Amateur and Semi-Professional photography insurance includes benefits such as cover for Theft, New for Old, Worldwide Cover, Public Liability and more as standard. Professional photography equipment insurance policies also include cover for Professional Indemnity and Business Interruption. On top of these benefits, you can choose Elective Benefits like cover for Gadgets and Mobile Phones, Waterproof Photographic Equipment and New for Old for Life. If you’re a new customer, you could also take advantage of up to 25% introductory discount! 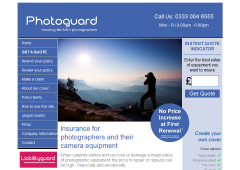 PhotoGuard insurance offers different levels of cover to suit the widest variety of photographers. With our flexible policies you can choose the options that match your needs. PhotoGuard Select insurance is suitable for amateur or semi professional photographers who earn less than 50% of their income through photography or related activities, and they also offer Photoguard Pro insurance, which is suitable for professional photographers who earn more than 50% of their income through photography or related activities. Affordable camera insurance giving protection against theft, accidental damage or malfunction. Protect your Bubble have developed a great value policy to suit all photographers, and their varied needs. Cameras and camera equipment can be used so often that you can sometimes forget how much you rely on it. Cameras are an excellent way to capture unique moments wherever you go. If your camera was stolen, lost, or damaged, you would suddenly notice just how often you used it and it's true value to you. 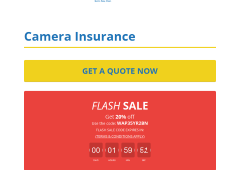 Camera insurance cover starting at just £2.19 a month! 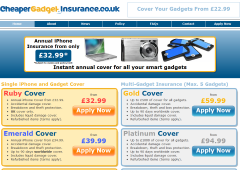 GadgetCover is a cost effective way to insure everyday gadgets, cameras and equipment that you use all the time without even realising. Cameras are developing at a fast rate, and now even the smallest camera can be worth a great deal of money. The trouble with technology becoming smaller is that it makes accidents even easier. A small digital camera is easily dropped, and the fragile mechnanisms can be easily broken. This leads to either an expensive repair bill, or a new camera. As we become more and more dependent upon our gadgets, it becomes more important than ever to look after them and protect them. If the unexpected happens and your vital gadget is accidently damaged, lost or stolen, then you will be glad you have protected it with a Cheaper Gadget Insurance policy. 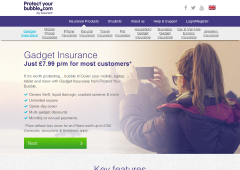 Cheaper Gadget Insurance offers cover for theft, accidental damage, accidental loss, breakdown, and malicious damage. The electronic device must be less than 36 months old with valid proof of purchase (not from online auctions) when the policy is started.